1. Your work exemplifies craft and it seems that in the last couple of years there has been a tendency for designers and artists to want to return to craft techniques. Why do you think this is? That is a great question. I think nostalgia may play a part because we are experiencing a great deal of difficulties in our society, politics, and economy. It seems natural to desire something simple, honest, and real. The DIY movement is also influential that encourages us to make things with our hands. While I can’t speak for other designers and artists, my return to hand made work after a decade of digital art practice is because I truly miss the physical process and love the materials and medium I work with. 2. Where do you think your work is best suited for? Galleries, exhibition spaces, photographed, illustrated books, etc…why? There is no close replacement for the experience of seeing actual, original artworks. Reproduction is necessary for purposes like documentation and distribution. At the end, I hope to reach and connect with others with the quality and impact of my original paper cutouts. So wherever one can come face to face with my works like in my studio, galleries, museums, and other venues is the place best suited for my works. 3. Something physical such as paper cut could be said to be far less versatile than a simple vector illustration. Is this a good/bad thing? Why? That is an interesting statement I don’t know if I agree with and it depends on what you mean by versatility. In terms of mass distribution and convenient editing, vector graphics may suit this need. And vector graphics do have a unique aesthetics and appeal. As a digital artist and taught Illustrator for many years, creating good vector graphics is no less easier. But personally, I am 10 out of 10 times more moved when seeing a paper cutout made by hand than a vector illustration. So in terms of spiritual and artistic versatility, there’s a sense of intimacy, romanticism, and humanity that paper cutouts exude. When I make or look at paper cutouts, I think about its long history, its diversity, its many anonymous artists, and its sheer beauty. 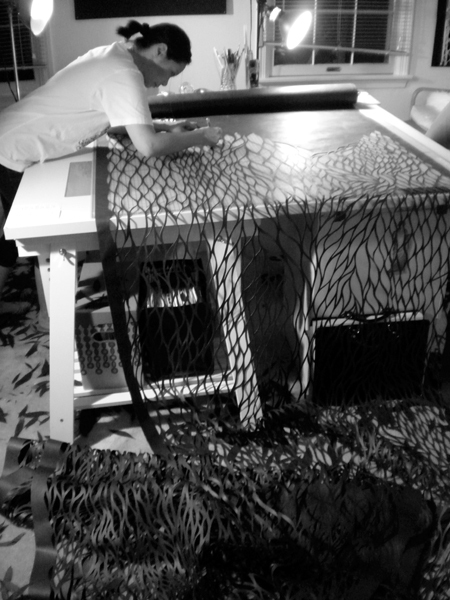 Hand cutting 30 ft. of "Black Water"